My family and I are making room for the coming multitude of My Amazing Day board books, so on Sunday we had a garage sale. We did fine with sales, but when it was over there was also quite a lot left. Gung-ho to clear space we made some quick decisions, and packed most of it in the car to take for recycling and donations. My husband Joe found out that the recycling center was open until 4:30pm, so while he finished cleaning at home, I quickly headed off with the Oakland A’s division-clinching game on the radio. The woman in the back of the Goodwill truck was helpful. I handed up bags, boxes, and loose items. She explained that she couldn’t take aluminum lawn chairs but they could be recycled in a nearby bin. She pointed out another bin for electronics items. It wasn’t until I was on the way home and the A’s were celebrating, that I reviewed what I had just given away and began to feel anxious about giving away a few of those items, particularly some decorated enamel-on-metal bowls. 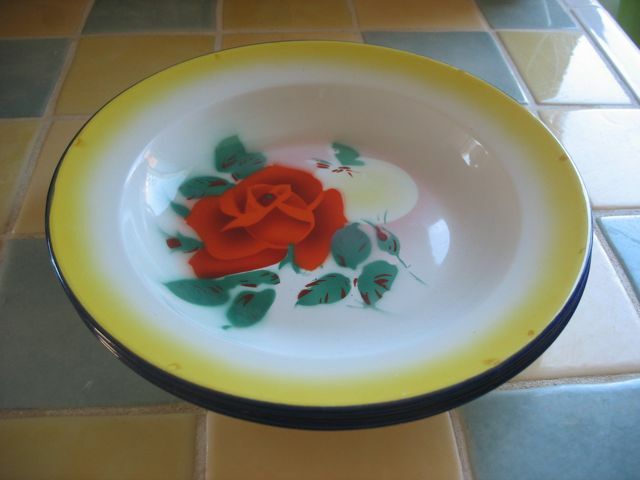 My mother and I had bought those bowls long ago at a small store, called Peking Duck, on Solano Avenue in Berkeley. Long gone now, the store sold imported items from China. Not the “made in China” stuff that could be from anywhere, but real Chinese crafts which the friendly proprietor often had something to say about. 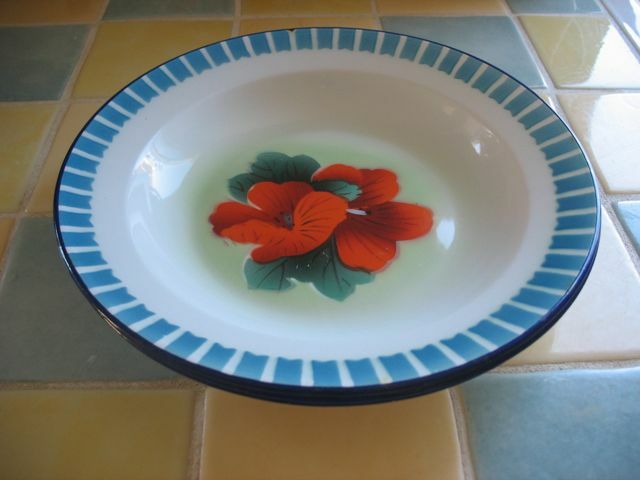 We appreciated the variety of designs in those bowls, the way they stacked so neatly, and how sturdy they were. They ended up following me out of the house, through various meals, camping trips, potlucks, and relationships. When I woke up this morning, and the bowls drifted into my thoughts, it occurred to me that since I had dropped the boxes at the end of the day, as of this morning the bowls’ box might not be buried in the truck. What seemed impossible last night, seemed possible this morning. I decided to put my mind’s chatter about overvaluing material objects aside, and just go for it. By the time I walked my son to school, attended the brief morning assembly, walked home, and drove to the recycling center, it would have been open for nearly an hour. Getting there earlier would help, plus I wanted to minimize the impact on other parts of my day. I asked my ever-more independent, third grade son if he’d feel comfortable being dropped off at a gate. He answered, “Sure!” After some discussion about how weird it felt to drive and debate about where to drop him off, we did it. I watched him walk off on his own, struck by how much more okay that felt than the one other time I did it a few years ago. My confidence that he would reach his classroom this time was complete. I drove on to the recycling center. As I’d hoped, it was not crowded. Another attendant was in the Goodwill truck, equally helpful. I briefly explained my situation. He asked me to describe the box, as I wasn’t allowed to look for it myself. It was a pretty regular box, but I’d handed it up yesterday with a dish drain sitting on top. First I spotted my son’s little-guy sleeping bag. It was very close to the front. Then I could just see the edge of dish drain. The attendant handed me the box underneath. At first I’d thought I had the wrong box. I’d expected it to be full of kitchen items wrapped in paper. But then I remembered stuffing that mattress pad on top. I started to reach under the pad to feel for the shape of the bowls wrapped in paper, but instead found the whole stack of bowls right there, stuffed in a fold of the mattress pad. I’d forgotten, that the decision to give away the bowls and their packing had been that hasty. I pulled them out, glad to feel them in my hand, then went to the car and reviewed all the designs, remembering places where they had been and people who’d shared meals served in them. I drove home on this sunny morning, in awe of how this thing that had seemed impossible had happened, wondering what it might come to mean to me. One thing that struck me is that this is a story of overcoming false limitations—the bowls weren’t impossible to find in that big truck, I didn’t have to wait until after the normal school drop off to go. After I got home I felt a little sad I hadn’t taken a photo of the old sleeping bag. I realized that was because it was linked to my son’s first camping trips. For the second time in twelve hours an emotion hit me hard, again in my chest, but this time with warmth, and it brought tears to my eyes. These objects mean something to me because they are linked to memories of often seemingly simple moments. I got how profoundly sweet it is to have so many precious memories.